Working on a monochromatic afghan means I have to have something colorful and small on the side to relieve the "boredom". I'm making half the squares using the Sunny Spread pattern, but still am searching for a pattern for the other ten squares. Luckily, I have tons of time to finish. 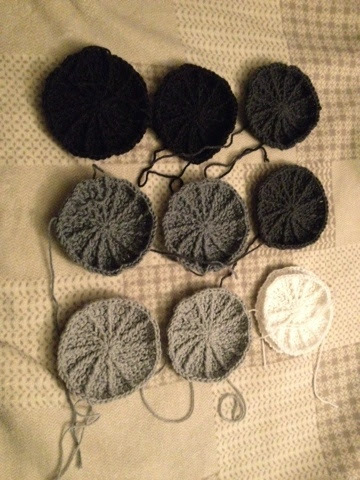 The debate is between going with all circular designed squares, or to have the others be more square. My top contenders are Spiky Circle, KISS-fist, or Cat's Claw. This week, I read a great post about taking better photos. As you can see from the above photo, I'm still working on some of the ideas--- I tried the "uniform" background (kind of), but obviously still need to work on it a bit. My biggest problem is my broken digital camera. I only had a point and shoot, but I dropped it on the beach over the summer while on vacation. And my iPhone takes fine pics during the day.... So a new camera investment may be in my future... We'll see. In other news, I'm likely to be staying in my current job, unless a middle school position opens at my home parish's school. My principal may be getting me into some Advanced Placement training this summer, and as that's something I've been interested in since high school, I'll be staying where I am for now. But my husband and I are looking at houses closer to my job, and we would love continued prayers in that area. I'll pray for you, Mary. Deciding about moving is difficult, even if the move is close. I look forward to seeing how the monochrome blanket continues to grow.